Is it just me or have there been a lot of birthdays lately and even more coming up within the next couple of months? I am one of those people who tends to go for the monogramming option whenever it is offered. I like the innate personalization effect it has and when it is a gift it makes it seem even more personalized. This iPhone case by Plum Street Prints is a relatively inexpensive and special gift that I thought I would share. 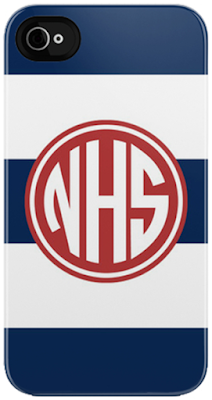 Really liking the nautical/patriotic theme going on here but they have a bunch of different designs and colors with monogram included in the set price. You also get to approve your design before it goes into production!